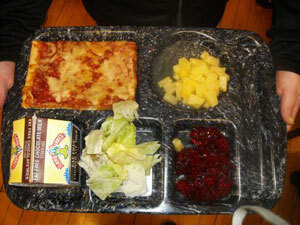 Last week Michelle Obama, Agriculture Secretary Tom Vilsack and Rachael Ray announced new nutrition standards for school lunches, the first major change in school meals in over 15 years. The program allots an additional six cents per school lunch—the first real increase in 30 years. The new standards call for more whole grains and produce, as well as less sodium and fat, and are the first to be enacted as part of the Healthy, Hunger-Free Kids Act of 2010, part of Michelle Obama’s Let’s Move! Campaign, which was signed into law last year by President Obama. It will affect the nearly 32 million kids who participate in subsidized school lunch programs each day—many of whom get half their daily calories from these meals. What’s different? Milk goes low- or no-fat, portion sizes shrink to limit calories, and fresh fruits and vegetables are offered every day, among other recommendations echoed in the Eat Healthy section of our 5 Easy Steps. I didn’t get a chance to ask him how we can have a choice, given the fact that GEs are not required to be identified on labels—yet are now in 80% of processed foods. Sigh. I guess we have to start somewhere. And these new standards are definitely better for our kids. Hopefully that pizza will have a whole-wheat crust. P.S. Congratulations from all of us at Healthy Child Healthy World to Mr. Wells’ 4th grade class at the Park School in Brookline, Massachusetts for changing Universal Pictures’ mind about eliminating green content from “The Lorax” movie. As our founder Nancy Chuda wrote last week, when the kids saw the trailer, they realized that the environmental themes–which, as any parent who’s read this story at bedtime knows, are the bedrock of the story–were largely missing. To restore the original meaning to the film, Mr. Wells’ class put together a video and petitioned Universal to add more environmental messaging to their website. And this week, after more than 57,000 people signed their petition, the Universal webpage was updated to reflect the students’ requests. Dr. Seuss once wrote, “Unless someone like you cares a whole awful lot, Nothing is going to get better. It’s not.” We’re inspired by these kids, who cared enough to make it better. A lot.